Two or more functions having same name but different argument(s) are known as overloaded functions. In this article, you will learn about function overloading with examples. Function refers to a segment that groups code to perform a specific task. 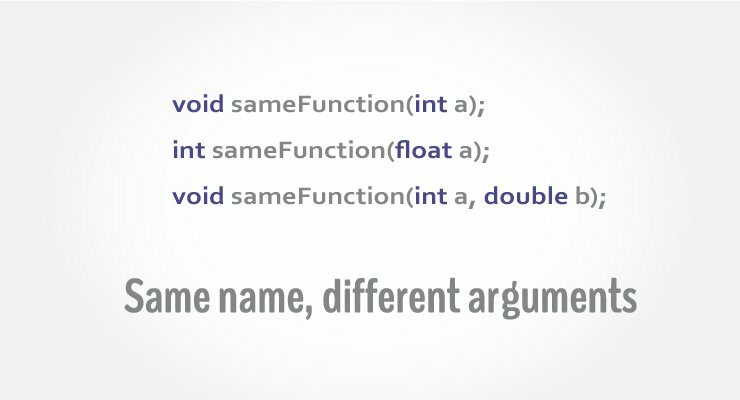 In C++ programming, two functions can have same name if number and/or type of arguments passed are different. Here, all 4 functions are overloaded functions because argument(s) passed to these functions are different. Notice that, the return type of all these 4 functions are not same. Overloaded functions may or may not have different return type but it should have different argument(s). The number and type of arguments passed to these two functions are same even though the return type is different. Hence, the compiler will throw error. Here, the display() function is called three times with different type or number of arguments. The return type of all these functions are same but it's not necessary. In the above example, two functions absolute() are overloaded. Both functions take single argument. However, one function takes integer as an argument and other takes float as an argument.